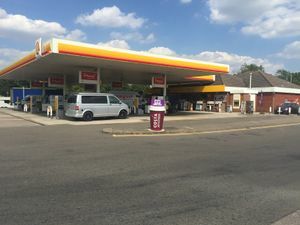 The services consist of a filling station and McDonald's at the end of the M42, primarily serving the A444. The service area was built on a farm called Appleby Field, positioned on what used to be the A453. Since it opened, there has been a debate between the landowners and various civil servants about whether the services could, or should, be signposted from the motorway. The argument has surfaced repeatedly since the 1990s. In December 2017 non-standard signs were added to the M42, but these may be changed. If official signs are provided, Appleby Magna would become an MSA, even though it doesn't provide the required facilities. However, improved signage would benefit the landowner, and is also an opportunity to reduce the number of fatigue-related accidents on the A42. The filling station here was previously branded Total, and before that, Fina.